John Carpenter’s In the Mouth of Madness (1994) is the closing film of a loose trilogy taking as its narrative hook and theme ‘the end of the world’. The Thing (1982) and Prince of Darkness (1987) are the other titles that form the triptych of apocalypse-themed terror. Insurance fraud investigator John Trent (Sam Neill) is hired by a book publisher (Charlton Heston) to track down missing author, Sutter Cane (Jürgen Prochnow). There is a manuscript to be delivered, and the guy’s gone AWOL. Yet, rather than slowly encroach the picture in the supernatural, In the Mouth of Madness is pure mayhem from the very beginning. The opening credits sequence, a montage of printing presses running off covers en masse, which looks very much like celluloid film running through a camera, to the accompaniment of Carpenter’s hard rock score, also signifies that we’re in for quite a ride. 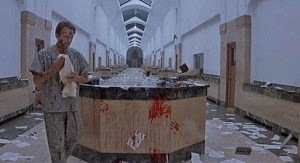 The opening scene sees a deranged Trent locked away in an insane asylum, and interviewed by a shrink (David Warner). It’s a traditional Lovecraftian device – a protagonist, once rational and of sound mind, turned insane by esoteric knowledge. There is a major difference, however. We know from the get-go that Trent is a few sandwiches short of a picnic. H.P. Lovecraft often left the ranting and ravings about Cthulhu and other eldritch monstrosities for the closing paragraphs. As Trent investigates the case, it is revealed that Sutter Cane isn’t just writing bestselling horror novels, but working under the aegis of beasts from beyond the stars, akin to the Great Old Ones from Lovecraft’s cosmic horror mythos. They are beings intent on wiping out humanity and reclaiming the world for themselves. The nods to the Rhode Island author’s canon of work run from the title (a play on At the Mountains of Madness, 1931), the narrative framing device, varying plot points and blink-and-you’ll-miss-it references. The quaint, picturesque New England town of Hobbe’s End is a bit like fabled Innsmouth, is it not? And Trent fleeing from the monsters in the second act is akin to the macabre climax of The Shadow over Innsmouth (1996). Cane, too, in his scheming and vision, is very much in the key of Wilbur Whateley, from The Dunwich Horror (1929). 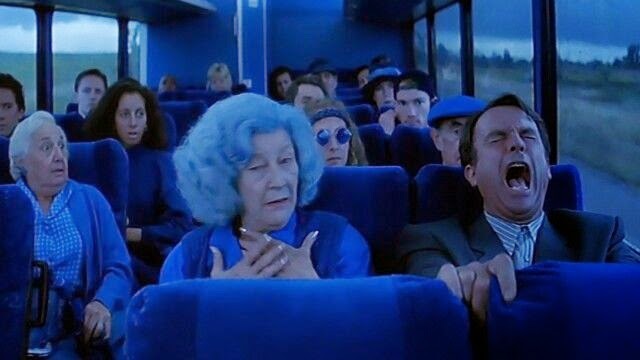 On this level alone, the film is a lot of fun. The central figure in Carpenter’s delirious nightmare picture, Sutter Cane, is as much the director’s persona as it is loosely inspired by American horror literature titans, Stephen King or H.P. Lovecraft. But does In the Mouth of Madness represent, too, a film artist in dialogue with his critics? If we tie in the rock-music score with the movie itself, along with the use of popular literature as an agent of chaos, Carpenter has formed an unholy trinity of media forms that have, at various points if the twentieth century, been met with censorship and fear. Carpenter’s subversive treatment of the material isn’t based on a navel-gazing exploration of artistic insecurity, but a way of reflecting upon a career spent as a genre film-maker. If you hate my work, Carpenter is saying to the critics, and this was made at a point when his critical stock was very low, you’re really going to hate this one! Of his standing in American cinema, he once stated that reviewers thought him ‘… a bum when I started out and they think I’m a bum now.’ John Trent’s yell – ‘Oh, no, not The Carpenters’ – as ‘It’s Only Just Begun’ blares over the PA system in the asylum, feels like an amusing taunt and establishes a massive amount of self-awareness. Taken as such, Carpenter’s approach to self-referencing and self-critiquing is far more subtle than in other 1990s horror pictures such as Lucio Fulci’s A Cat in the Brain or Wes Craven’s New Nightmare. Carpenter would never be so ostentatious as to cast himself in the role of Sutter Cane. Therefore, the H.P. Lovecraft angle of Michael De Luca’s screenplay is the perfect cover. It deflects attention, via Lovecraftian tribute, while simultaneously embedding what can be said to be a hidden subtext within the movie. Here we have an auteurist spin on Hitchcock’s MacGuffin. And it is telling, too, how Carpenter ends the film (SPOILER AHEAD). Trent staggers through deserted streets and enters a movie house showing Carpenter’s own adaptation of Sutter Cane’s In the Mouth of Madness. Starring … Sam Neill. The madman sits in the dark laughing his head off. Has the snob finally succumbed to the power of genre cinema, or is he on the verge of tears? Carpenter’s 1994 horror picture is a clever and insightful piece of meta-fiction. Although indebted to the nightmare world of H.P. Lovecraft, its sly comic sensibility is more in the vein of James Whale. Carpenter might also heartily agree with Hitch’s declaration that for him cinema wasn’t a slice of life, but a slice of cake.